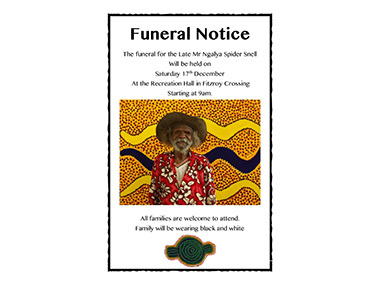 Artist, dancer, teacher, and latterly, film-star, Nyilpirr Spider Snell has died in Fitzroy Crossing, the Kimberley town he settled in after a desert birth and a working life as a stockman in the 1980s. He was one of the last great Wangkajunga rainmakers, having been born at the waterhole called Kurtal in the Great Sandy Desert about 1930. Anthropologist Norman Tindale photographed Spider there in 1953, but he was already initiated into the importance of ceremonial dance. We saw that dance again last year when Nicole Ma's excellent documentary film, Putuparri and the Rainmakers was released, showing Spider Snell struggling to re-find his birthplace waterhole in 1994 – when income from painting at the Mangkaja Art Centre first permitted him to return to the Great Sandy Desert – but knowing just what to do when he got there. His ceremonial dance evokes clouds, lightning and eventually a mighty storm, from which everyone has to flee. “I am jila. I am one of his lightnings,” Snell told the film-makers, before returning to paint himself in ceremonial mode back in Fitzroy Crossing – a marvellous work in the AGNSW collection, also featured in the Gallery's book, 'One Sun, One Moon'. The Gallery's description is detailed: “The acrylic painting, Kurtal, 1996, is a self-portrait of Spider dancing the Kurtal ceremony. The figure wears the long black rain cloud called kutukutu as a headdress made from from human hair, grass string and wool, accompanied by other black clouds outlined in white and red. These wilarn (horse-shoe shaped clouds) can appear in a clear blue sky to signal the approach of rain. The kutukutu is the first rain that follows, and can be a fierce rainstorm. Works by Spider’s brother, the late (and equally great) Jarinyanu David Downs, also depict this subject matter”. Nicole Ma's film also revealed what a struggle it can be to pass on the desert traditions in a township like Fitzroy Crossing. 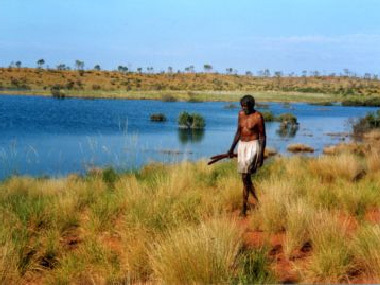 The Putuparri in her film's title is Spider's grandson, Tom Lawford. Tom's aware that he should take on Spider's responsibilities, but the pressures of family and urban life all-too-easily lead to drink, abuse of his wife and prison. Even a year accompanying the Wangkajunga people's important 'Ngararra Canvas', which involved 50 artists painting their Country on to a vast canvas in order to prove their Land Rights and Snell dancing on his section of it when the vast work is rolled out in Canberra, doesn't help Lawford enough. But as Spider – now a spindly man in an outsize hat - visits Kurtal for the last time by helicopter, desperate that it retains its living water, its invisible Snake Spirit and its magic – for a man who comes from Kurtal will return there after his death - Putuparri finally acknowledges: “All the more reason to hand his responsibilities on to us young fellas – we'll be the next Rain-makers of the desert”. Another of Spider and Dolly's Snell's grandchildren is Ningali Lawford, the actor and writer whose show 'Ningali' in 1997 first introduced many theatregoers to the importance of language in the retention of Aboriginal culture. As a youngster, Spider was often left alone while his parents went hunting: "I was a good kid, looking after my own self. My mother and father went hunting sometimes for two days or more. At night I would say, ‘Kurtal, I’m alone, my parents haven’t came back yet. Can you look after me?". Later, as a young man, he became a skillful stockman, handling horses and cattle on Christmas Creek Station. In 1997, he received an Australia Council Dance Fund Fellowship for his dance practice. “He had enormous standing within his cultural milieu that was equal to Western fame,” says art co-ordinator Karen Dayman. She worked with Snell in setting up Fitzroy Crossing’s Mangkaja art centre, where he painted his first artworks for exhibition in 1994. 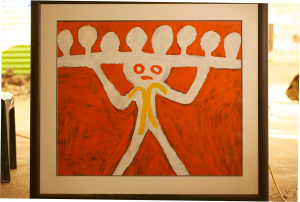 Ten years later, he won the Telstra General Painting Award at the National Aboriginal & Torres Strait Islander Art prizes, while his wife Dolly, who died earlier this year, took out the Big Telstra last year. The couple had met on Christmas Creek cattle station. A statement from artists at Mangkaja Arts Resource Agency in Fitzroy Crossing describes Spider Snell as an "incredible cultural leader and founder of Mangkaja Arts. Mr Snell inspired so many and his legacy will live on in the lessons he taught us all about the power of culture and his connection to his country and family. "Travel safely home to Kurtal old man. For Snell believed himself to be inseparable from the place that gave him his power.